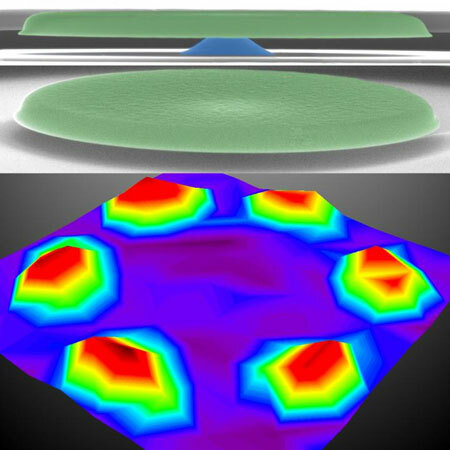 (Nanowerk News) For the first time, scientists have vividly mapped the shapes and textures of high-order modes of Brownian motions--in this case, the collective macroscopic movement of molecules in microdisk resonators--researchers at Case Western Reserve University report. To do this, they used a record-setting scanning optical interferometry technique, described in a study published today in the journal Nature Communications ("Spatial Mapping of Multimode Brownian Motions in High Frequency Silicon Carbide (SiC) Microdisk Resonators"). The new technology holds promise for multimodal sensing and signal processing, and to develop optical coding for computing and other information-processing functions by exploiting the spatially resolved multimode Brownian resonances and their splitting pairs of modes. "What we found agrees with the expected Brownian motions in high-order modes," said Philip Feng, assistant professor of electrical engineering and computer science at Case Western Reserve and senior author of the study. "But it has been pretty amazing and exhilarating to directly visualize these modes down to the fundamental limit of intrinsic Brownian motions." In his lab at Case School of Engineering, Feng worked closely with research associate Max Zenghui Wang and PhD student Jaesung Lee on the study. Interferometry uses the interference of light waves reflected off a surface to measure distances, a technique invented by Case School of Applied Science physicist Albert A. Michelson (who won the Nobel prize in science in 1907). Michelson and Western Reserve University chemist Edward Morley used the instrument to famously disprove that light traveled through "luminous ether" in 1887, setting the groundwork for Albert Einstein's theory of relativity. The technology has evolved since then. The keys to Feng's new interferometry technique are focusing a tighter-than-standard laser spot on the surface of novel silicon carbide microdisks. The microdisks, which sit atop pedestals of silicon oxide like cymbals on stands, are extremely sensitive to the smallest fluctuations arising from Brownian motions, even at thermodynamic equilibrium. Hence, they exhibit very small oscillations without external driving forces. These oscillations include fundamental and higher modes, called thermomechanical resonances. Some of the light from the laser reflects back to a sensor after striking the top surface of the silicon dioxide film. And some of the light is refracted through the film and reflected back on a different path, causing interference in the light waves. The narrow laser spot scans the disk surface and measures movement, or displacement, of the disk with a sensitivity of about 7 femtometers per square-root of a hertz at room temperature, which researchers believe is a record for interferometric systems. To put that in perspective, the width of a hair is about 40 microns, and a femtometer is 100 million times smaller than a micron. Although higher frequency modes have small motion amplitudes, the technology enabled the group to spatially map and clearly visualize the first through ninth Brownian modes in the high frequency band, ranging from 5.78 to 26.41 megahertz. The high sensitivity and spatial resolution also enabled them to identify mode splitting, crossing and degeneracy, spatial asymmetry and other effects that may be used to encode information with increasing complexity. The researchers are continuing to explore the capabilities of the technology.